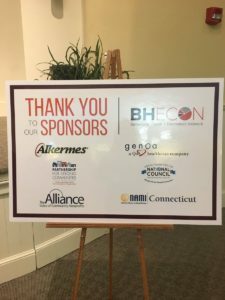 The second BHECON forum in Connecticut convened stakeholders for a discussion on what lessons could be learned from a successful state-wide movement, specifically Reaching Home­—Connecticut’s movement to end chronic homelessness. During the forum, a panel of housing providers, foundation representatives, coalition leaders, state agency officials, and other stakeholders shared how they built and sustained a successful movement for policy change. Discussion centered on how the behavioral health field could learn from this movement and adapt its lessons to address challenges across the behavioral health service system. Attendees left the forum with concrete ideas about how to unite around a common agenda for change. The major themes that emerged from the forum discussion focused on collaboration, goal setting and resource coordination, and messaging. Janice Elliott, Executive Director of the Melville Charitable Trust, emphasized how collaboration is key to building a successful movement. In the case of the Reaching Home campaign, engagement and listening sessions were held across the state for community members to share what resources were most needed in their area. Information from these sessions, as well as ongoing listening efforts, help the Reaching Home partners make policy decisions that are driven directly by challenges seen in the field. Another essential step to the movement’s success was building and growing relationships with legislators and government administrators, as Alicia Woodsby, who directs the Partnership for Strong Communities, shared. Woodsby recommended that mental health providers build relationships with legislators and agency officials by giving them the opportunity to tour their facilities and meet with the clients served. These relationships help coalitions find legislative champions who can fight for public dollars and favorable policy changes on their behalf. One concern that arose during the discussion was about how to make state agencies work better with one another, considering that mental health crosses the jurisdiction of many different agencies. In order start building these cross-agency relationships, the panel suggested finding a specific project that interests and benefits all the agencies involved in mental health. To ensure successful collaboration, the panel noted that it is important to have a funding source for collaboration efforts. 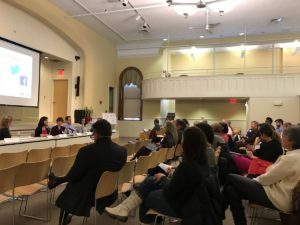 Connecticut’s homelessness coalition did this by earning the investment of a philanthropic partner, the Melville Charitable Trust. Funding from the foundation allowed them to finance regular collaboration across campaign partners, including finding a leader to organize the diverse groups. “Our policies are informed by people on the ground and that’s what makes them successful,” Alison Cunningham, CEO of Columbus House, discussing a bottom-up policy-making approach. Another key to Reaching Home’s success was establishing big goals that inspired coalition members to act and defining clear roles for plan implementation. In working towards these goals, Alicia Woodsby and Janice Elliott recommended that coalition leaders keep stakeholders focused on points of agreement and avoid fueling points of disagreement. This strategy allowed their coalition to gain early victories and these early victories led to future success. Alice Minvervino from Connecticut Department of Mental Health and Addiction Services added that it is important for individual stakeholders to move towards a community-wide approach for achieving goals instead of an agency-level approach. Moving to a community-wide approach encourages greater sharing and coordination of existing resources. Steve DiLella from the Connecticut Department of Housing explained how data can also be effective in coordinating existing resources. For example, the Connecticut Department of Corrections and the Connecticut Department of Housing worked together to reduce recidivism through innovative data matching across their agencies. 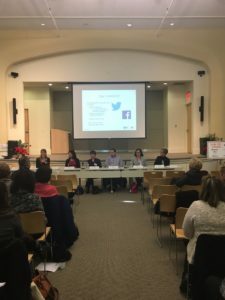 The Connecticut campaign to end homelessness grew with the help of a strong advocacy message that focused on people and data. Movements are ultimately about people, Janice Elliott emphasized, and therefore media-messaging and progress measurements should highlight people. Another effective message for the Reaching Home campaign was explaining that it actually cost more for the government to do nothing than to actively address the homelessness problem. Reaching Home partners presented elected officials with strong evidence on what housing models have helped homeless individuals stabilize in the community. Importantly, advocates pointed out that these interventions are less costly than continuing to provide services to individuals experiencing chronic homelessness, who tend to use expensive emergency services at high rate. Overall, forum attendees gained an understanding of the core elements needed to build and sustain a successful statewide movement. Attendees walked away energized to start increasing their collaboration with diverse stakeholders, creating unified goals, and developing a strong advocacy message for mental health. “Follow the evidence,” Steve DiLella, CT Dept. of Housing, explaining how to ground advocacy messaging in strong data and research.